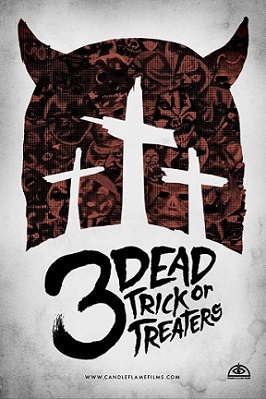 The Canadian indie horror 3 Dead Trick or Treaters is nothing if not novel. But it’s not a random juxtaposition, like a bunch of banjo players banging out Beethoven’s 9th; the film works within a tradition that goes back, not just in horror, but to the beginning of cinema itself in that it’s free of dialogue. You could call it a silent film, if it weren’t for the wealth of lush and extremely evocative instrumentation — cellos to reverb-laden acoustic to electric plucking and flamenco guitars, violins, and yes, even banjos…And it’s an anthology too. How’s that for juxtaposition? To the extent that 3 Dead Trick or Treaters succeeds more than it fails, is an achievement given the circumstances…So let’s break it down, shall we? Two Kitchener/Waterloo-area teens meet in front of a repertory cinema, then pick up some Halloween accouterments before heading off into the wood, masked, and with “F” markings on their hands. They knock on the door of an abandoned house, and are ushered inside. Right off the bat, the lack of context doesn’t do this segment any favors. However, the stellar visuals and foreboding tone carry the day. The smell of baking cookies in a country home is paired nicely with the horrors of young adults enforcing Leviticus 20:27 and putting a suspected witch to the test: “A man or woman who is a medium or spiritist among you must be put to death…” Easily the best of the four, Malleus Maleficarum fires on all cylinders. This vignette makes wonderful use of fall colors in Southwestern Ontario, as masked trick or treaters make a candy offering to the Halloween gods, and one of them falls short when it comes to his haul, even, horror of horrors to anyone who’s experienced this as a kid: getting an apple. Two of the most slovenly-looking cops you’ll ever see track down a missing person in the woods. But things are definitely not as they appear. When anthologies go well, the viewer gets varied bite-sized entertainment, often with a tastily creative wraparound. With lesser lights, there’s the benefit of segments being mercifully short. Either way, it’s a pretty favorable format. But being quiescent on the dialogue front? That’s certainly a challenge! Kudos for the chutzpah when it comes to even trying to pull this off…Torin Langen (Late Night Double Feature) does a mostly impressive job and deserves commendation. This entry was posted in Horror and tagged 2010s movies, anthologies, Canadian film by Really Awful Movies. Bookmark the permalink.